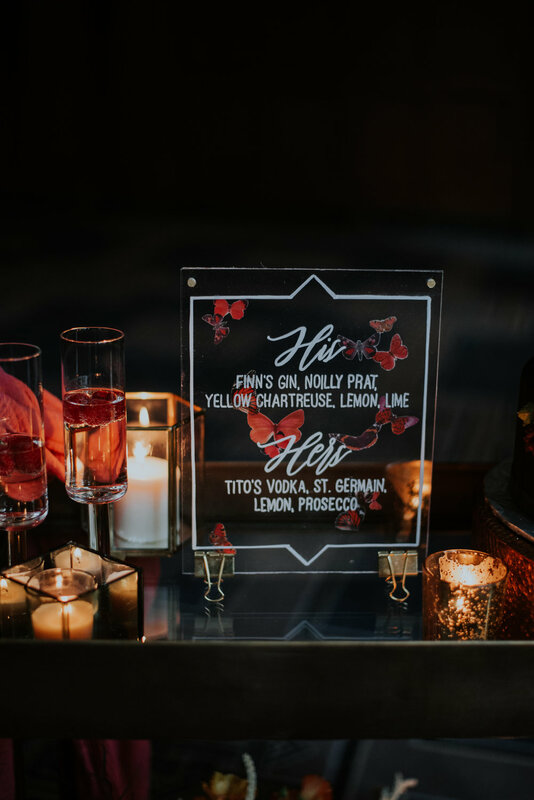 The inspiration for this collaboration between Olive Fine Weddings & Events and Stone Fruit began with the remarkable butterfly. The emergent butterfly’s dazzling first flight can only happen once, as with the wedding day itself, but like the couple, it is forever changed. Stone Fruit’s stationery set the tone for the day. Our setting, the historic Allegro Hotel in Chicago, inspired a touch of Art Deco glamour and geometric motifs. A translucent overlay on the Save-the-Date gave the effect that the printed butterflies were floating above the dark, dutch floral still-life. 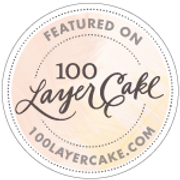 Marble accents, vintage stamps (including butterfly stamps, of course! ), a red, butterfly wax seal, and gold foil pulled everything together. Every element of the stationery hints at something in the scene of the day. French tulips from the still-life bloom in Persephone Floral Atelier’s bouquets. 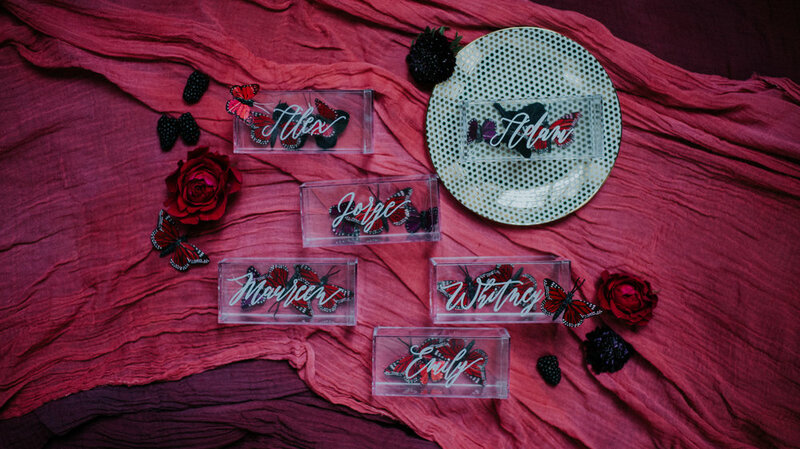 The butterflies come to life in three-dimensions inside hand-lettered acrylic boxes at each place. 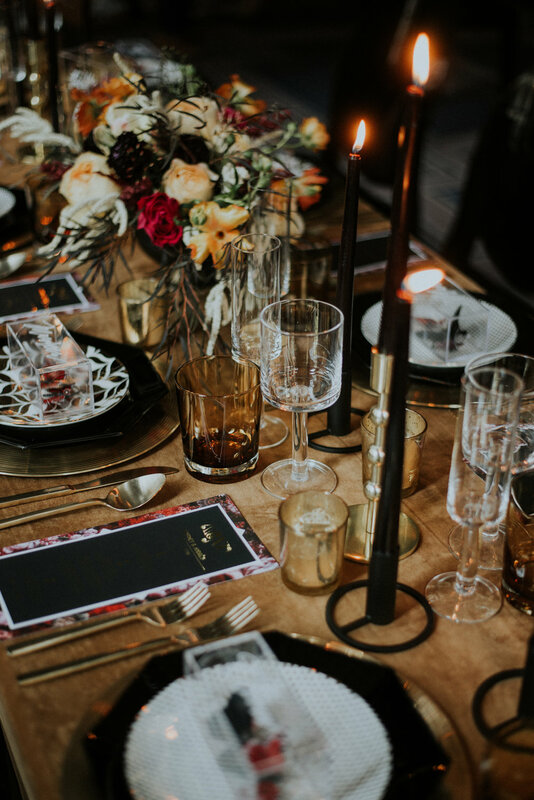 Gold foil flashing from deep, black paper mirrors the flickering ebony candles on the table and at the ceremony. 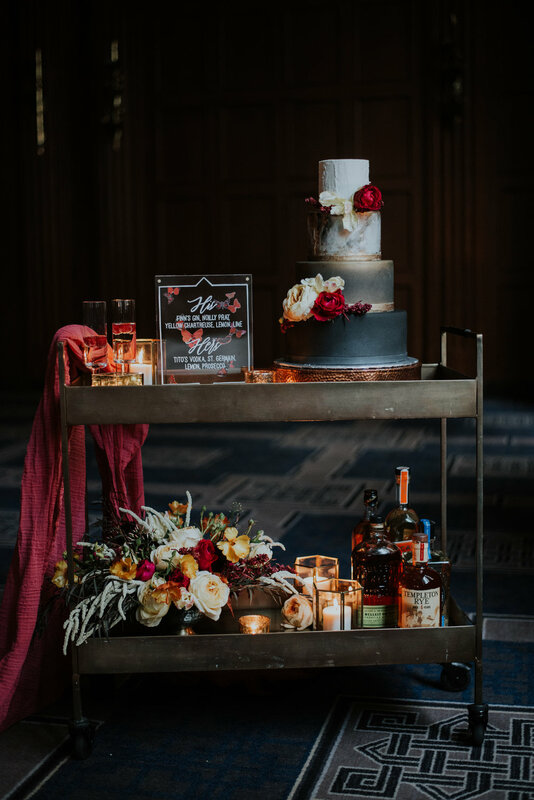 The marble accents reappear in the three-tier cake, artfully decorated by ECBG Studio. We got all the Chicago feels when our models and real-life couple, Emily and Jorge, took their first look on the Washington and Wells L platform. When our groom turned around to see his girl for the first time in her sleek, long-sleeved Alexandra Grecco gown, he broke out in a pure, love-filled smile and a train flew by, right on cue. 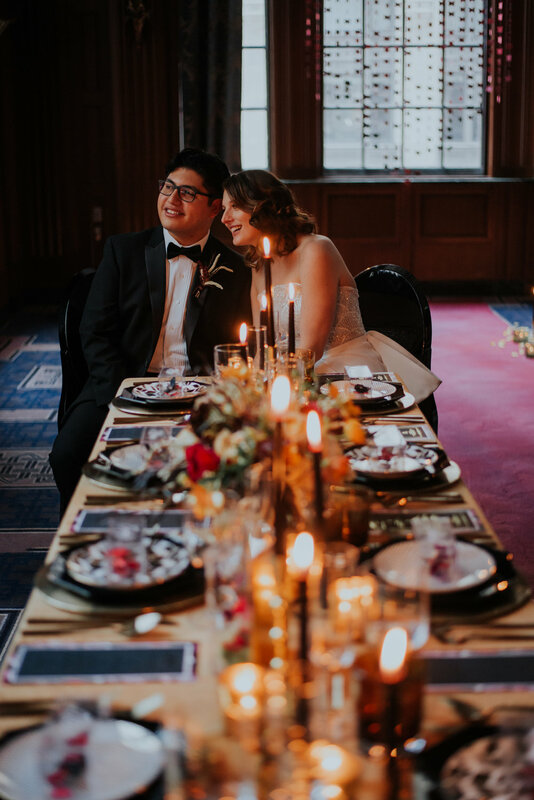 The first few moments of their embrace were lovingly captured by Allie Appel Photography. Fluttering butterflies truly took the stage in the ceremony. 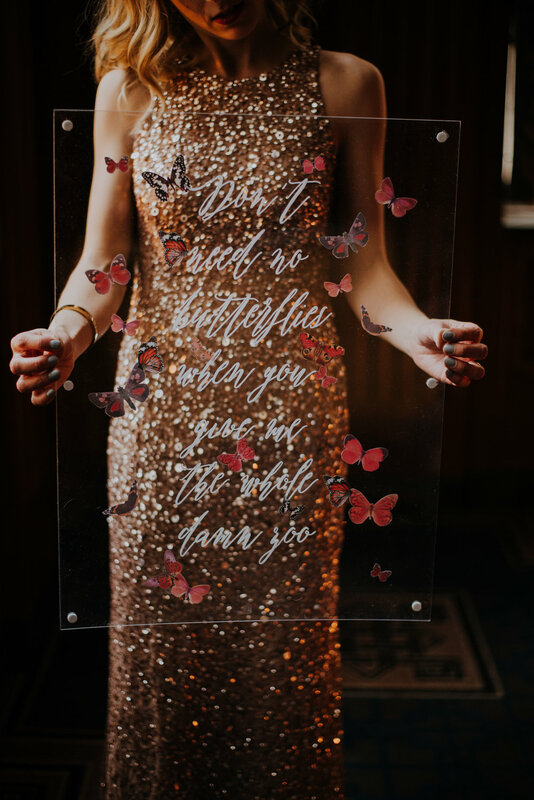 Illuminated by glimmering candlelight and flanked by sparkly bridesmaids holding butterfly hoops in place of bouquets, our couple exchanged vintage wedding bands from Cottage Jewelry in front of a dancing paper butterfly backdrop. Post ceremony, the bride swapped her first gown for a sculptural, statement number by Chicago designer, Sarah Varca, and a pair of red butterfly heels. 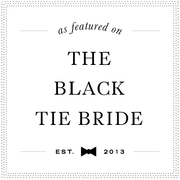 She snuggled up with her groom at the velvet-clad table in a shadowy corner of the Allegro Hotel while the L train rumbled past the ballroom windows. And a gorgeous video of the day by Floating Home Films.